I know I haven’t give any riding updates for a while but while the bike is being stored with a friend in Tehran, I’ve taken the opportunity to take in the sights around the city and beyond with Lynne. It’s been nice to have a break from riding and I’ve had the opportunity to learn a lot more about Iran from the people we’ve met along the way. I only have a three months visa for the Schengen countries (Germany, Belgium, Spain, France etc) so don’t want to arrive there too soon and have to leave before the FN rally! For a comparison, traffic in the cities here is on par with India, dented vehicles, everyone going every which way with no semblance of order. What I found interesting was the number of bikes parked illegally being loaded onto a trailer behind a tow truck and impounded. They are held for at least a week – a real nuisance to riders no doubt. Certainly not a place to try riding the FN around! We did manage to find our way by taxi to the Central bank containing the world’s largest collection of gems, (the Imperial Crown Jewels of Iran) including diamonds, emeralds, sapphires, rubies and the famous Koh-e-Noor & Darya-ye-Noor Diamonds, the world’s largest. Displayed in the banks vault the array of bejeweled crowns, jewelry, costumes, thrones and other items is staggering. In fact, it’s too much to take in at one time. We retired to the foyer to watch an English translation depicting the collection and we found this more interesting. Outdoors, it’s hot & dry, making it hard going on narrow pavements negotiating around bikes, white goods and the crowds of bustling people. Everything from washing machines, plastic pipe, exhaust fans, tyres and mobile phones are on display. Unlike Australia the streets seem to focus on selling just one commodity with the next street selling something different. We visited the Golestan Palace with its cool, shady gardens, Unfortunately only one room was open to the public the day we arrived, but it provided a glimpse of its former glory days. In the nicer parts of the city there are designer stores, galleries and eateries including a vegetarian restaurant where we relaxed in a lovely garden setting. Behnam, a young guy I met in Yazd, invited us to join his family for an evening. It was a welcome opportunity to gain an insight into true Persian hospitality. We spent a lovely evening chatting with his family and friends, feasting on a beautiful array of nuts, dried & fresh fruits, sweets, and that was before dinner! A wide variety of delicious food, including fresh mushroom soup, chicken, kebabs, salads, vegetable dishes, desserts and more sweets. Behnam insisted we eat plenty but with Lynne still recovering from a stomach problem & me as skinny as a rake after weeks on the road, it took some convincing that we were amply satisfied. Behnam is about to go to Wollongong University to study for three years, so we look forward to meeting up with him when we return to Australia and sharing some of what Australia has to offer. It’s amazing how many Iranians we’ve come across who have lived in Australia or have relatives there. We been fortunate to discuss a wide range of topics with people we’ve met, including politics, women’s rights, and so much more. Lynne will write in more detail about this on Facebook, once she is able to access the site – something that isn’t easy to do here unless you know how. From Tehran it was a 15 hour train journey to Shiraz, not much more comfortable than the bike but given it was overnight we thought this was a wise option. 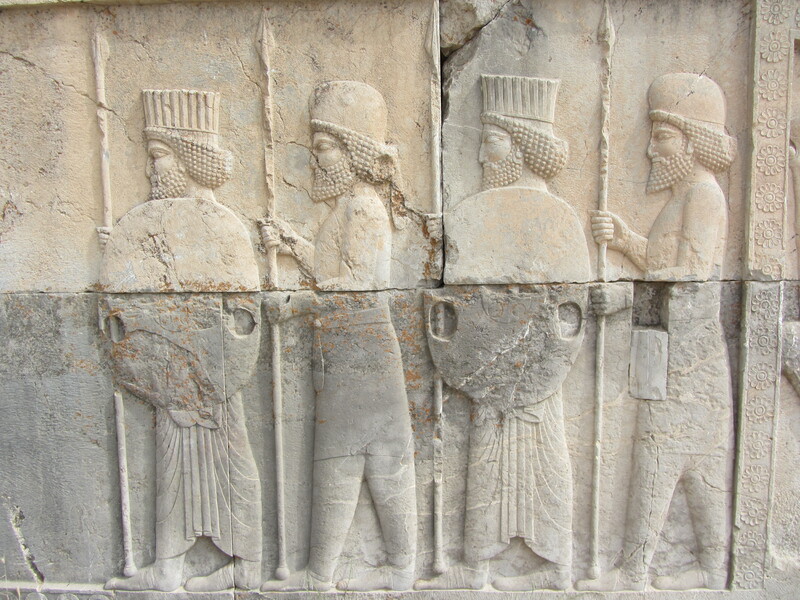 Shiraz is a very peaceful city though for us the real attraction was Persepolis, the seat of ancient civilization. Located about 50kms away this UNESCO world heritage site was the ceremonial capitol around 550 – 330 BC. An easy drive took us to the old city where Alexander the Great in 330 BC invaded the palaces, setting fire to the buildings, though it is not known if this was by accident or deliberately happened in a drunken act of revenge for the destruction of Greek temples. Later his troops looted the city taking with them all the jewels & precious goods loaded onto 3000 camels. Hewn from rock taken from the mountains directly behind Persepolis along with dark grey marble, ornately carved pillars some as tall as 25 metres and sculptures adorn what were the many palaces of Darius the Great. 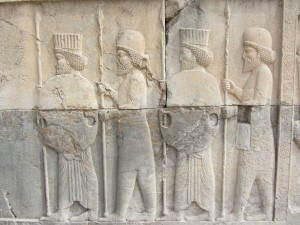 Then 10 kilometres further on is Necropolis where the 4 tombs of the former rulers are located. After a tour and many more photographs our guide Kharim drove us to a cool spot for a picnic – where we enjoyed fresh watermelon, hot tea & biscuits. Hundreds of Iranians on Thursdays & Friday their holy day, abandon the city and head to the nearest patch of green grass, to erect a tent, spread out their blankets, light a barbeque and have a picnic. It’s such a popular pastime the roads are clogged with city dwellers heading for the hills on every public holiday. The cool brick bazaars of Shiraz and Isfahan are a welcome respite from the midday sun and can take hours for visitors to walk through. Each is a maze of carpet shops, utensils & clothing, dried fruit, nuts and sweets. Old men beating brassware and stamping traditional paisley designs on locally grown cotton with wooden blocks, women painting ceramics, stamping out fine tinware, jewelry & shoe shops, galleries and so much more. Lynne was in heaven when she discovered a shop selling old Afghani & Iranian tribal jewelry. The pieces she chose didn’t look that impressive to me but what would I know about such things? Give me a bike part or an antique horn and I’m happy. The Palace of the Forty columns, with beautiful friezes on the old walls depicting merchants from Asia & various parts of Europe, featured exquisite tiled ceilings, ancient mirrors & artifacts all still well preserved. A good deal of restoration work is going on here and in the other cities we visited. Back in Tehran we took a bus northward to the Caspian Sea, reputed to be very scenic and quite different from the arid deserts of the rest of the country. On the way to one of the four bus terminals (north,east, south & west) we passed the beautiful sculpture the Shah of Persia had erected in honour of John Kennedy, a vision in it’s day and still extremely modern. We had a two hour wait for a VIP bus due to a road closure, but enjoyed sitting in the terminal people watching – always a fascinating way to pass the time. Touts shouted out to encourage passengers to choose their bus. It’s a very competitive market and the buses we traveled on were all luxury coaches, providing movies, snacks and a comfortable ride to the next destination. This journey to the north proved to be one of the highlights for us in ways we least expected and we discovered a little piece of paradise hidden in the hills – more on that next time, then it’s back to riding on to Turkey. Great to read tt Ron is ok and is close to the border. Good luck in Turkey – another country, another adventure. Tyres are great – good & strong, so should get me through a few more countries. Thanks so much for arranging them. Massoud was terrific – such a nice guy and very helpful. Now in Dogubeyazit and heading to Van tomorrow. Pretty cold here but I imagine it will warm up as I head west. we were with many tourists but we never forget you man..you are a real gentleman.. I enjoyed Iran very much – many happy memories, especially meeting the two of you. Now in Turkey and lots more to look forward to. Bike is running well & I’m camping out most nights. Thanks for your kind words, it was a pleasure knowing you both. Yes, I’ve been out of touch a lot in the past few weeks too but now have better internet & phone access so looking forward to keeping the blog updated more regularly. Another country and a new one to enjoy with Turkey! hello lynne and ron nice to know that you are enjoying some touristy stuff at the moment and that your adventure is still on track. i’ve had distractions but the fn work is prgressing slowly got the flwheel clutch together and trying to get clutch throw from europe at the moment the pistons are onthe way as well as the magneto gear and big ends seem to be ok all takes forever doesn’t it kind regards to you both and i hope that your trip all gets easier from now on. cheers! wal. Good to hear the FN restoration is progressing, even if it is happening slowly. Once you receive all the parts you’ll be flying! Great to be on the road again. Hard going for some of the way through the last part of Iran but we made it. Looking forward to something different here in Turkey – I imagine it will be quite scenic after the desert country I’ve been in. Bike is going well and have new, better quality tyres which is a relief. Happy for you to add my blog to your site – it looks really interesting and I look forward to reading a few of the stories from other travellers once I get the chance. I feel the hard part is now behind me but no doubt the old FN will throw me a few challenges when I least expect it!